My original career intentions were to work therapeutically with people but I ended up working on team effectiveness in the corporate world for 25 years. As I became ready to transition to a different way of living, I became certified as a personal trainer to start moving back to my goal of helping people. While I enjoyed working with individuals on their fitness, the mind-body connection was missing. I searched for yoga teacher training in Seattle (where I lived at the time) and found what I was looking for – Whole Life Yoga. Under Tracy Weber’s mentorship, I found the perfect combination of functional yoga training that supported my fitness certification, packaged with yogic options to increase wellness at all levels. Tracy opened my eyes and my heart to exploring yoga therapy tools for myself as well. A week before I started studying with Tracy, I had a major disc herniation (C6-C7) and was sure I had to cancel my training. Tracy convinced me instead that I would learn through my own experience how to protect my injury while keeping the rest of me in balance as I healed. A year later, I was 90% healed with no surgery. It’s been just over three years since I moved to Pender Island, a thirty minute ferry ride to Victoria, B.C. I set out deliberately to not set up a business but to do things differently – to contribute to the island ensuring that I would feel a fair exchange of energy. My therapeutic yoga focus, especially private yoga therapy combined with personal fitness tools distinguished my services on the Island. I set up guiding principles for myself that would support my objective of complementing and partnering with others in the wellness business, where possible. I would charge the going rate ($10 drop in and $60/session for privates – very low in comparison to city rates, I know). I would do my best not to schedule my classes against other yoga classes on the Island. Before our house renovations, I offered small Viniyoga classes in my basement. There two cement poles around which I carefully positioned mats for visibility. I began to work privately with people on the island who had various issues – my neighbor who was sadly dying of terminal colon cancer with complications from pulmonary fibrosis. I did gentle postures with him 3-4 times a week focusing on gentle breath work to relieve the anxiety he increasingly felt as he needed to use his oxygen tank more and more. A 72 year old woman who was overweight, deconditioned and depressed felt that her active days were over. We worked together to shape a combined personal training program (cardio and strength) as well as a series of 15 minute private yoga home practices to increase her fitness but also her sense of self-confidence and control over how she felt. She continues to come to my ongoing drop in classes and workshops today. Today I offer 6 yoga classes a week – some drop in, some therapeutic series such as Yoga and Aryuveda and work with people privately on a regular basis. I am so grateful for the solid foundation that Tracy and Whole Life Yoga gave me in yoga therapy. I can still hear Tracy saying that I will go to “yoga jail” when I sometimes put too many backbends together or pay more attention to how I’m feeling instead of to those that I serve. Where will yoga on the Island go from her for me? My answer today is simply, I will do the next indicated thing, providing value where I can and continuing on this lifelong path of yoga. This entry was posted in Asana, Guest Writers, Teacher Training, Teacher Training Graduate Stories, Teaching Yoga, Viniyoga on November 28, 2011 by Tracy Weber. I’m always happy to get calls from senior students looking to begin a yoga practice for the first time, as well as from parents looking for yoga classes for their children. Of course, the sooner you start yoga, the better, but yoga is not simply a practice for the fit and the young. Viniyoga, in particular, is well suited to serving individuals of all ages, fitness levels, and conditions of illness or health. Since we offer a methodology, or approach, to yoga versus a given posture form, sequence or temperature range, we can teach a variety of clients from the hospitalized and very ill, to teen-aged gymnasts, to everything in between. Krishnamacharya (the founder of this lineage) practiced yoga his entire life, until he was well over 100 years old. In short, Viniyoga is a practice that can (and should) serve a person throughout their entire life. The goals and methods of yoga practice should change to meet the specific needs of each stage of life, however. In youth (the sunrise stage of life), we focus on increasing strength, stamina, and concentration while promoting balanced development of the body and mind. This typically means stronger, fitness oriented asana (postures) with a stricter focus on form. Of course, even children often benefit from a more therapeutic type of yoga, and in that case we focus on healing practices while still integrating the play and challenge children love. From about the mid 20’s to mid 70’s (the mid day stage of life), our goal is to stay healthy, active, and to heal from the injuries and illnesses our bodies have picked up along the way. We therefore decrease our focus on strong asana and increase our focus on developing the breath. We also use yoga postures therapeutically to overcome injury and illness, and to promote balance in the musculoskeletal, physiological and emotional systems. Yoga can still help us gain strength and flexibility, but the goal shifts from stronger asana to more breath-centered, adaptive asana. In our later years (the sunset stage of life), our goals shift yet again. From the time we enter our late 70’s until we pass on, our goal is to stay as self sufficient, mobile, and healthy as possible. 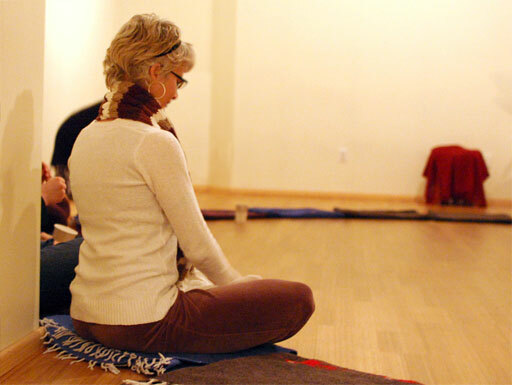 We use meditative asana and breath work to maintain physiological health and to keep our bodies functional as we age. We also incorporate more meditation to help us focus the mind and prepare for our next journey to whatever is beyond this life. No matter what your current age, you can definitely benefit from yoga. You’re never too young or to old. Age is no excuse for not starting a yoga practice, or not continuing it. As you change with time, so will your practice. And in that transformation, you may well find a depth and beauty you never thought possible. This entry was posted in Asana, Breath, Meditation, Viniyoga on November 21, 2011 by Tracy Weber. Kristen asks: Should all yoga teachers be licensed or certified? This is a loaded question, and one that I feel strongly about. Currently there is no WA state or US wide regulation of yoga teachers. Most days I think that’s a very good thing. Government is good at many things, but understanding yoga isn’t among them. In New York, they recently tried to pass legislation that would have required licensing and certification of yoga teachers. That legislation, however, proposed that yoga teachers be certified by the exercise industry, not the yoga industry. And the exercise industry knows so very little about the true meaning and purpose of yoga. I honestly believe that, had this law passed, the quality of yoga programs in that state would have suffered. That said, having no certification or regulation requirements can lead to misuse of the term “yoga teacher.” There are people all over the country who teach yoga with little or no formal training. Often times they have a strong personal practice and can do all the poses. So, they figure, why not teach? That not only demeans the profession of teaching yoga; it can be dangerous. Untrained yoga teachers can ask students to do things that are unsafe, may not know how to modify poses for bodies different than their own, or may not fully understand the impact of their teaching all together. So, if I don’t want licensing, but I DO think proper training is essential, where does that leave us? As a yoga studio owner, I do require that all of my instructors be certified; not for the certification paper per se, but because the certification demonstrates a level of dedication and training. In fact, at this time I only hire people who have been certified through my program. I know their capabilities; I know their ethics; I know their hearts. I know I can trust them with my business and with the students that make it great. As a consumer, I would personally only take yoga from someone who is certified or who has taken an equivalent level of training from a reputable school. Many schools in India don’t certify per se, but they do offer excellent training. So, as the saying goes, “Let the buyer beware.” Wherever you take yoga, be sure to ask the instructor where they received their training, how long the training was, and if they are certified. If they can’t answer or their training was less than 200 hours, then just be aware that they may not have a significant level of education in how to safely and effectively teach yoga. Whether or not you want to continue taking yoga from them is a completely personal choice. This entry was posted in Student Questions, Teacher Training, Teaching Yoga on November 13, 2011 by Tracy Weber. This week’s blog entry is written by guest author Tiffany Blackburn. Tiffany is a graduate of Whole Life Yoga’s teacher training program. She can be contacted at tiffanyblackburn.com. It took me so long to practice yoga for myself. I went to countless classes over the years, dutifully doing everything the instructor called out. I did every “if you want to work harder…” option that was offered and I never accepted the invitation to “rest if you need to.” I reached higher, sank deeper, stretched further whenever the teacher walked by or glanced my way. I compared myself relentlessly to the stronger, more flexible people on the mats around me, and struggled to keep up. I was practicing to please the instructors and to gain the admiration of my fellow students. I was practicing with the exact opposite of mindfulness — I was practicing mindlessly. Over time, practicing and attending the 200-hour Viniyoga teacher training, I came to better understand both yoga and myself. I’ve come closer to accepting the fact that we all have limitations, and some things just don’t work for my body. I found that easing up a little has actually allowed me to progress further, and that it doesn’t matter what anyone around me is doing. Now I frequently take the opportunity to rest during practice — even if the teacher is looking. This entry was posted in Asana, Breath, Guest Writers, Teacher Training, Teacher Training Graduate Stories, Viniyoga on November 7, 2011 by Tracy Weber.